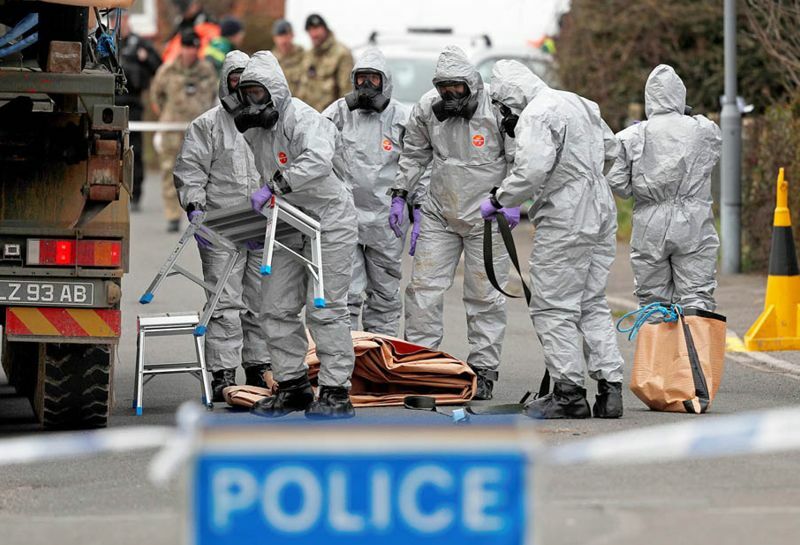 Russia apparently used Novichok, a deadly nerve agent, to attack an ex-spy on British soil. Aren’t such weapons banned? Western and former Soviet scientists say the nerve agent was created in a Soviet lab in the 1970s in what is now Uzbekistan. During the Cold War, the U.S. and the Soviets ran secret chemical and biological weapons programs, experimenting with the deadly pathogens that cause diseases like anthrax, smallpox, and plague. Russia denies it ever made advanced nerve agents, but when Soviet chemist Vil Mirzayanov fled to the U.S. in the 1990s, he revealed the existence of Novichok, its chemical makeup, and details of its production, saying the Soviets had stockpiled enough to kill several hundred thousand people. Novichok is a binary compound, meaning it is made by combining two other, less dangerous substances just before it is administered. That makes it hard to police. Once the poison comes into contact with a human body, it wages a fierce assault on the nervous system, causing muscles to involuntarily and violently contract; victims can die of suffocation or heart failure within minutes, their eyes rolled back. Even minute doses can cause permanent neurological damage. There is no reliable antidote. How did it get to the U.K.? That’s unclear. After whistleblowing ex-FSB agent Alexander Litvinenko was poisoned with polonium in London in 2006, investigators were able to trace the trail of the radioactive isotope across the city, implicating specific Russian agents and even the Aeroflot flight they arrived on. Novichok, made on the spot, leaves no such signature. Sergei Skripal—a former double agent who served time in Russia for betraying secrets to London—and his daughter, Yulia, keeled over on a park bench in Salisbury. They are in intensive care, and a policeman who attended to them fell ill. More than 130 other people may have been exposed and could develop seizures or motor disorders. The gruesome lethality of such weapons is why they are illegal under international law. The Chemical Weapons Convention—negotiated after the Soviet Union broke up in 1991 and in force since 1997—prohibits the large-scale development, production, stockpiling, and transfer of chemical weapons. It was a huge breakthrough at the time, and the U.S. helped the USSR’s successor, Russia, destroy its stocks. Russia claims it finished doing so last September, ahead of schedule and the U.S. But there’s a loophole: Production of many toxic chemicals with industrial uses, such as in fertilizer or medicine, is allowed as long as countries alert the international monitoring body. Such a system relies on the good faith of the governments involved. Russian President Vladimir Putin scoffs at international norms and agreements, and has drastically ramped up Russian research into biochemical agents. In a 2012 essay in the government mouthpiece Rossiyskaya Gazeta, Putin said Russia should develop genetic and “psychophysical” weapons to defend itself against its enemies. Since then, Russian researchers have been experimenting with everything from chemicals for crowd control to genetically modified pathogens. Biosecurity in Putin’s Russia, a new book by Raymond Zilinskas and Philippe Mauger, documents the recent large buildup at more than two dozen Russian military labs and government-run research centers, many of them former Soviet biochemical weapons sites. A walled complex in Yekaterinburg—the site of a 1979 accidental anthrax release that killed 100 people—has a bunch of new warehouse-size industrial buildings. Russian scientists have also been purchasing expensive, specialized lab equipment for freeze-drying microbes and for testing aerosolized bacteria. Do other countries have chemical weapons? Russia claims, with no evidence, that the U.S. is still developing them (see box). It’s clear that rogue states Syria and North Korea do have them, and Russia has assisted both countries’ programs. During the Syrian civil war, the Bashar al-Assad regime has used sarin and chlorine gases against rebels and civilians numerous times, and Russia has used its veto power in the U.N. Security Council to block investigations. After one such attack, President Obama struck a 2013 deal with Moscow to remove Syria’s chemical weapons, and the U.N. verified the destruction of the listed sites—but the attacks have continued. North Korea, meanwhile, is believed to be behind the killing in Malaysia last year of Kim Jong Nam, the brother of Kim Jong Un, with the nerve agent VX. How is the West responding?